Side 1 printed with 3 PMS colors using heavy coverage. 12pt C1S Semi-Gloss stock coated with Aqueous Matte. 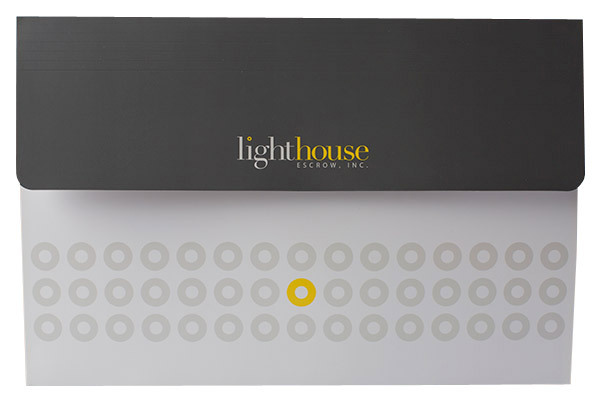 Like a beacon guiding a ship at night, a single yellow circle shines on a foggy, pale gray panel to summon clients to their important escrow documents. The brand's name illuminates the dark gray flap, which latches with a Velcro closure to safeguard the documents inside. Rows of tiny circles wrap around the pocket, helping establish brand identity without overplaying the yellow accents. The dark back panel takes on a stormy, atmospheric tone. Written in a script font, the word "home" symbolizes individuality and excitement. 1 foil stamped area on Side 1 of uncoated 100lb Deep Black Linen stock. Black Velcro® closures. A vibrant black and red design evokes a tone of elegance and sophistication for vacation planner Eccentry Holidays. Its logo is stamped in Metallic Apple foil, which shimmers and shines for an eye-catching brand element. The candy red color also spices up the matte black stock, which has a visible linen pattern that stands in sharp contrast to the foil's smoother surface. These differing textures create a one-of-a-kind tactile experience that helps recipients build sensory memories of the brand. Side 1 printed with 1 embossed area and 1 foil stamped area on uncoated 90lb Deep Blue Hopsack stock. H1 business card slits on flap. 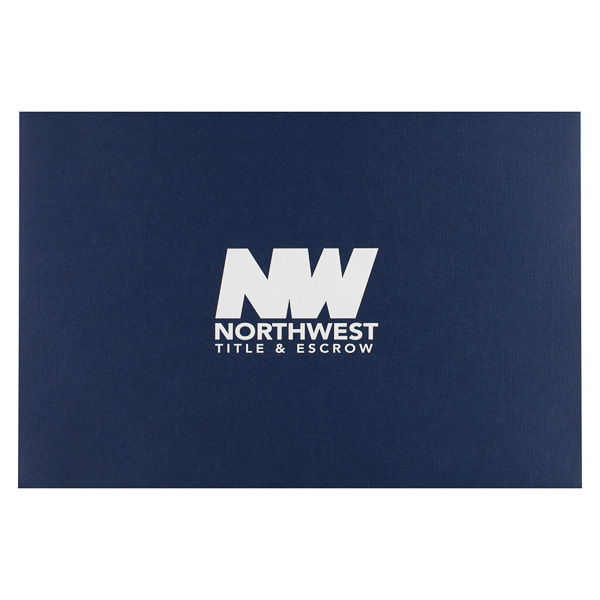 Northwest Title & Escrow chose a professional, corporate look for its expanding portfolio design. Only the logo and company name is on the front in a Non-Metallic White foil stamp, adding a smooth texture to the Deep Blue Hopsack stock. The N and the W are connected to represent the close relationship between the title company and its clients. 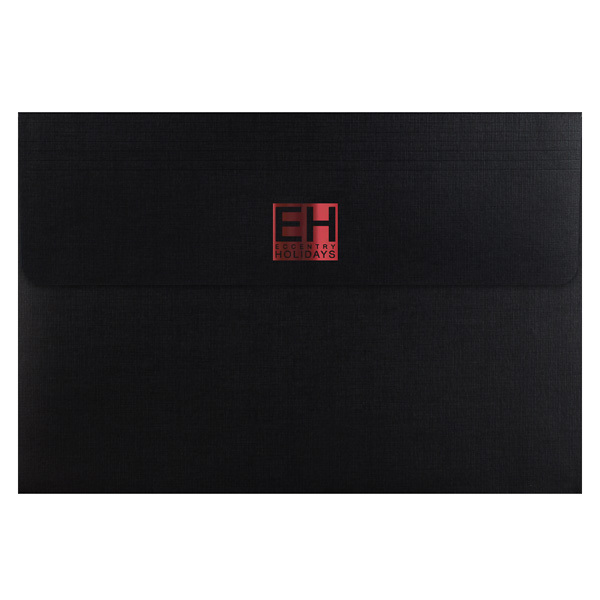 An embossed logo is featured on the flap, along with the slogan “Service at its highest level.” A Velcro button seals the portfolio to make sure no important documents are lost. Side 1 printed with 1 PMS color using heavy coverage on 12pt C1S White Semi-Gloss stock coated with Aqueous Gloss. Customers have plenty of space for their documents from Cap Com Federal Credit Union in this expanding portfolio. The green and white color scheme is reminiscent of the color of money and signifies the credit union is secure. 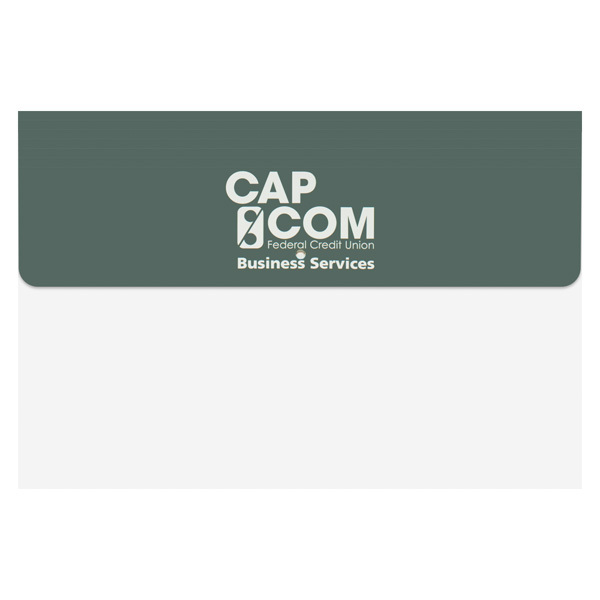 Cap Com’s name and logo are on the flap, while its contact information is on the bottom of the back. A sealed gusset allows the single pocket to carry up to 1 1/2" of print media sized 14" x 8 1/2", from slim legal packets to thick contracts and proposals. The gusset's rigidity allows the product to lay evenly, whether it's brimming with papers or carrying only a handful of documents. Score lines along the flap make it flexible enough to bend and close over the pocket. Make the flap extra secure with optional Velcro® or elastic band closures.